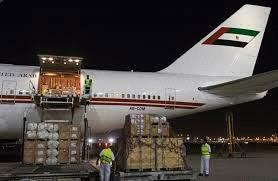 AMMONNEWS - Two planes loaded with aid donated by the United Arab Emirates for victims of bad weather and flash floods that affected Jordan recently landed in Amman Monday morning. HRH Prince Ali bin Hussein, who was on hand to welcome the aircraft, thanked the UAE for its continued support of the Kingdom in the face of challenges. He also thanked Sheikh Mohammed bin Rashid Al Maktoum, Ruler of Dubai and UAE Vice-President and Prime Minister, and HRH Princess Haya Bint Al Hussein for the assistance, which was dispatched upon their directives, and for their concern through contacting the National Center for Security and Crisis Management since the severe weather struck.